Prague may be know for its sights but it also has plenty of green areas that are perfect to cool down after walking up and down the city on hot cobblestones. The biggest park in the wider central area is the Stromovka park, our jogging destination of choice. You can walk through it to the Troja district with plenty of attractions: the Prague ZOO, which consistently ranks as one of the best zoos in the world, the Troja Chateau that hosts the Prague Drinks Wine Festival, or the St Clara vineyard. And you can finish strong with wines at the Salable winery. For the perfect summer ending, take the boat back to the centre. If you want to dedicate less time to your park-dwelling, try some of the smaller parks closer to the centre. The Letna park offers some great views of the Old Town, a very popular beer garden, the Containall outdoor workspace underneath the Metronome overlooking the city, jogging routes and easy access to the Letna district. The Petrin park is fairly quiet for how central it is. Sadly, not many choices for food and drinks, but it is a great place to start your approach to the Prague Castle. Finally, Parukarka in the Zizkov district is the most local and the most punk of all these parks, especially if you count in the “pub” in the middle of the park. This is what memories are made of. Prague’s walled gardens are another place to cool down after a walk. In the New Town, sitting down on a bench in the Franciscan garden is a classic local pastime, especially when combined with the ice-cream by the nearby Svetozor deli. We normally would not recommend it but we’ll give you a pass if the temperature is over 85F. Just get the sorbets. You may regret another choice. And then there are the gardens in the Lesser Town district: Vrtbovska zahrada, Kinski garden, or the Wallenstein garden, or even the Kampa park are all great and provide the much-needed shade. Perfect when combined with ice-cream from the nearby Angelato, one of our favorite ice-creams in Prague. Having a glass of cold beer underneath leafy trees is the ideal way to finish a hot day in Prague in our book. We recommend two beer gardens: the Letna beer garden has a great view and a really nice, young atmosphere in the summer. People chat, drink, play board games or pétanque and enjoy the city as it cools down. For instant friendships, make sure you visit the Riegrovy sady beer garden, the biggest beer garden in the city with the seating capacity of 1,400. The perfect place to watch a sports match on two big screens, too. But we recommend you buy a beer in the plastic cup for once and go to slope in the park, sit down and enjoy the view of the city, just like nearly everybody else on a nice day. Trust us, you’ll like it. Fancy a better beer? Buy one at The Tavern on the other side of the park. And you can get their pulled pork burger, too, if you're hungry. Sure, Prague is not particularly known as a beach resort, and for good reason. Still, if you want to get a tan or immerse for a bit in cold water, the city offers some cool and cooling opportunities. For the best (and the only) sandy beach in the city, take the 3 or 17 tram South to the Podoli stop for the Zlute lazne beach resort. This is where overheated locals go to socialize and pretend they are on a vacation in Cancun, complete with beach volleyball courts and beachside bars. If the beach is not your thing, just walk across the road to the Podoli pools that date back to 1965: one Olympic-size pool inside, and two more outside with stands for nearly 12000 spectators. The inside pool actually is one of the best examples of Mid-Century Modern architecture in Prague. Don't expect you'll be bathing in solitude if you visit these two places. 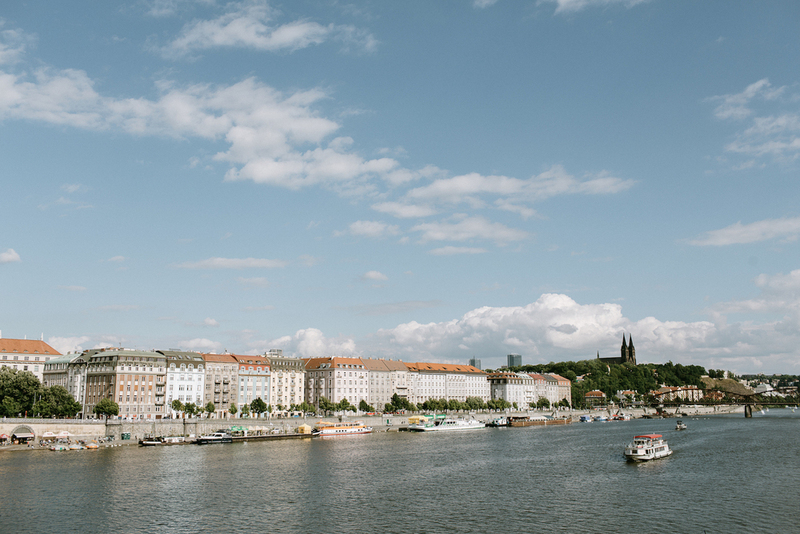 Going back to the city, make sure you stop by the CERE Yacht Club (yes, we do have a yacht club here in Prague) and continue on to the Naplavka, the recently remodeled riverside that has become a very popular place for parties and cafes and bars frequented by young locals. Also, the Saturday morning farmers’ markets underneath the Vysehrad fortress are one of the best ways to spend Saturday mornings in the town. Other water resorts require some commitment and travel outside of the centre. The Divoka sarka pool is located in the Divoka sarka valley, one of the most beautiful pieces of nature in the city. It is a classic destination for locals that offer some great hiking opportunities in the forest around it. In the very likely case you like trains and swimming, you can combine these two passions by visiting the Radotin swimming pool. Yes, it is on the very outskirts of Prague and no, you cannot walk there. The easiest way to get there is… the S7 train from the Main Train Station. But you’ll be rewarded by a refreshing swim and a visit to a part of Prague only a few foreign visitors get to see. Finally, if you like to move on the surface of water, we have three tips: the paddle boats around the Bridge of the Legions are a classic date. Jan has a strong belief that there is no paddle boat other than the “swan", so you should hire that for that old-time feeling. If you'd like to try some rowing on the Vltava river, you must head over to the VK Smichov club and persuade (or bribe) someone to rent you a boat because normally you’d need to buy membership and go through the 12 introductory rowing lessons for newbies. Finally, adrenaline junkies may be interested to know that you can get some rafting done in the White Water Centre in the Troja district, a venue that hosts many international water slalom events. Again, you can follow on to the ZOO or the Stromovka park for added shade. Yes, there is something redeeming and calming about sitting underneath a huge parasol, letting the breeze cool you off and drinking a cold beer. If you want to have a meal outside and have something Czech to eat, there are a few options. The Cestr steakhouse has a grill outside that does good meat, burgers, fish and so on. And when the grill is off, you can order anything from the (air-codinitioned) restaurant inside. Sometimes we wonder whether the chefs look out of the window or never leave in the restaurant because whenever the temperature rises about 30C, it means one thing: they will put on something really heavy on the menu, like the golden muscle cooked in goose fat. Because that’s what you want to eat on a hot day. Goose fat. But you don’t have to order it. Problem solved. Another Czech restaurant with outdoor seating is the Kastrol restaurant. Sure, it is pretty far from the centre but the food is great and authentic, and the seating outside is very nice. If we want to treat ourselves to something nice, we always visit Story. Yes, eating at Story is… well… different. The location is not central. And the service is less than ideal. But then the food makes up for the rest. Great quality in a very casual setting. And you can continue to the Hvezda park nearby for the post-food stroll you will need. Jan used to go there with his grandma whenever she felt hot, and it worked. Finally, some of Riccardo Lucque’s bottega bistros, namely the Bottega Gastronomica underneath the TV Tower, have nice outdoor seats and the food is light and nice for the summer. And all of the cottages are air-conditioned, too. Truth be told, it's pretty hard to find a good salad in Prague, because only a few places get it right. Beets and goat cheese, anyone? Pizza Nuova, a place we like to frequent in the summer, does not offer outdoor seats (actually, it does, but the four tables on the busy street downstairs should not count) but it is air-conditioned, and - most importantly - has a self-service salad bar with antipasti and small bites and salad, and you can get a plate for about EUR 6, or go for the all-you-can-eat option if you need it. And their pizza is one of the best in Prague. We also like the salads in Cestr, which despite being a steakhouse, works really well with vegetables. We only wish they did more with them and were a bit more seasonal. Finally, the chain of Bottegas offer some nice salads with Mediterranean and Middle Eastern touches that we like in the summer. And as a bonus, all these places are air-conditioned. Hooray! Who wants to eat something hot in the summer? You’re right. Nobody. Sushi makes perfect sense in the summer. Our favorite place for sushi is probably Mash Hana near the Hradcanska subway stop. It is near our home, and run by a Japanese family that knows and greets its Japanese and Czech regulars like old friends. And they play classical music, something many other restaurants in Prague should do. And the sushi is very good in our opinion. Other places locals go to for sushi include the popular Yami and the newly opened Yoshihashi Sushi near the Dlouha street in the centre, or the Hanil and Yamato on the edge between the Vinohrady and the Zizkov districts. There’s nothing like a scoop of delicious ice-cream on a hot day. We wrote about our favorite ice-cream in Prague already, but for a quick recap: both locations of Angelato are great, places that sell 2AD ice-creams are even better, and Puro Gelato is trying hard to get to where Angelato is today. Try them all if the weather demands it. We did write about cafes that sell iced coffee drinks recently. While we do love coffee any day of the year and any time of the day, iced coffee brings some of the much needed fuel to our caffeine addiction while keeping you cool. Our secret tip would probably be Misto with their air-conditioned room, the perfect iced Irish Coffee and Rosemary, the runner-up of the 2015 Coffee in Good Spirits SCAE World Champs. Cafe Lounge also has a great, cool garden in the back and barista Vojta’s cold brew is one of the best in town. Finish with anything cold in Muj salek kavy, another air-conditioned cafe in town. Drinking alcohol on a hot day can be a tricky affair: have one too many and the world around you might start to spin. That is why we recommend that you get your drinking somewhere cool. For instance, the central and the biggest location of the Vinograf wine bar is perfectly air-conditioned and offers more wines by glass that you - or anyone - could drink in one night. Also, Black Angel’s bar has air-conditioning, which is well needed because it’s a smoking bar. L’Fleur, our current favorite, is also air-conditioned, which means you can get your drinking done and remain cool in all possible ways. Rooftop and open bars are another option for drinking with a breeze in your hair. T-Anker on the top of the Kotva department store in the centre offers several craft beers on tap and a stunning view of the Old Town Square. (Just don't eat there.) Cloud 9 in the “big” Hilton also has a great view - enough to be closed for a private dinner of the Obamas a few years ago - and is air-conditioned, too. Finally, Jazz Dock, one of the most popular jazz club in town, can be considered an open bar with a bit of imagination: when the big windows of the boat that houses the bar open into the water lock, it can make for some memorable drinking. Nothing says summer like an outdoor cinema in our book. Seeing a movie in the open is a classic summer evening activity, and you should partake in this, too. Don’t worry: the movies are subtitled so if the audio is in English, you’ll do just fine. The Vyletni kino Smichov just opposite the Naplavka farmers’ market is a great venue by the river with a fully-stocked bar, which makes it even better. Letni kino Regina in the Karlin district is a great opportunity to see a nice movie and explore the Karlin district. If you don’t have the coffee at Muj salek kavy or tea at the Tea Mountain before, and natural wines in the Veltlin wine bar after, the movie, you are seriously missing out. Finally, Meetfactory runs their Summer Cinema series in the summer months, with a new movie, selected by the moviegoers from a selection of two, shown every week. Other independent cinemas are a good idea in the summer too. A cinema is dark and always cooler than the outdoors. For that perfect summer movie, we’d go to the Bio Oko cinema, which, in addition to regular seats, offers that you see a movie from a beach chair or even a convertible for that perfect summer feeling. Their beach chairs outside of the movie theatre’s bar just add to the experience. For more independent cinemas around the town, please see our post. Getting some cycling done in the summer is a good idea, as Prague’s cycling routes are expanding more and more every single year. There’s only one place you should go: our friend Filippo’s BIKO Adventures shop. Whether you want to rent a bike or get a guided bike tour of Prague or its surrounding areas, this is your place. Our favorite route is the basic Naplavka - the riverside on the Eastern side of the river. Just start in the centre and ride the bike south until the Modrany district and further. Sure, you’ll get a tan, but there’s lots of little shops that sell drinks and quirky stops along the way. And it’s not a difficult ride, anyway. Walking through the crowds on the Charles Bridge around noon? Thank you, but no, thank you. We’d rather see something where we can get a breather and enjoy the shade. Our first choice? The Deer Moat underneath the Prague Castle. A shady, steep valley below one of the most crowded sights in Prague has it all: history, calm, solitude and shade. Follow on to the Novy Svet area on one side, or to the Royal Gardens and the Letna Park on the other. Another great sight that is nearly empty and gets lots of shade and cool is the St Agnes Convent. Remember one thing: Gothic means cool inside, and the National Gallery’s installation of its Medieval Arts is fantastic. Finally, the marble mass of the National Memorial at the Vitkov Hill will also provide some shade and cool inside, along with a fascinating exhibition about the history of Czechoslovakia. You just have to get there somehow: it’s on the top of a rather steep hill. But that’s nothing an Uber or Liftago ride would not fix. Whatever you do, stay cool in Prague and enjoy!